14.6 TON CORDLESS HYDRAULIC CRIMPING TOOL | Tallman Equipment Co., Inc. The next generation of Cembre cordless hydraulic tools represents a significantly advantageous evolution from current models. Born of the renowned B131LN-CA type crimping tool, B1300L-CA will accept all semi-circular slotted dies, common to most 12 tons tools (U dies). Featuring a large 1.65 in. jaw opening, for an easier introduction/removal of large size compression terminations and joints. 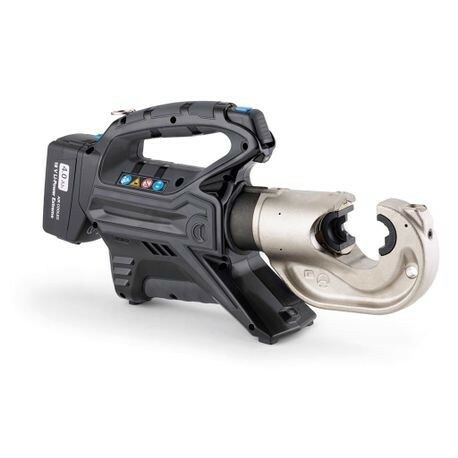 New Li-Ion 18 V (4Ah) batteries offer a higher capacity than 14.4 V (3Ah), while greater crimping speed and crimping force result from a revitalized hydraulic system with double speed action: a rapid approach of the dies to the connector then a slower, more powerful speed for crimping. A maximum pressure sensor and pressure relief valve assure greater precision and repeatability of the pressure cycle and double the provision for operator safety. 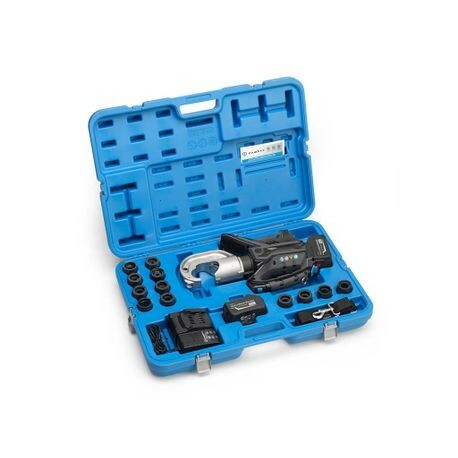 Kit includes: Tool, (2) 18 V Lithium-ion batteries, AC charger and plastic carrying case suitable for storing the tool and 12 die sets. Dies sold seperately.